This 67,650 word Contemporary Romance is the second book in the Morning Lake series. I'll update this page with new retail links as the book release unfolds! After washing everything with a hose, Annie itched to scrub her hands, but someone new had arrived. It was Quinn. Shoot—she had to disinfect before she could even peep at the turkey. She waved to him and raised her index finger. She mouthed, "I'll be right back." When he nodded, she ran into the house to pour antibacterial soap over her hands and forearms. The house was quiet. Milt and Merry were probably having a nap. They'd have to meet him later, like tomorrow at Thanksgiving. Hearing the front door open, she said, "Do you have my turkey? Bring it into the kitchen." He arrived in the kitchen with empty hands. "In the truck," he said. "Well, it can't stay there." "Annie, did you know you ordered a living turkey?" She shook her head. "What do you mean, living?" "It made turkey noises at me the whole drive back. It wasn't happy about the wind, by the way." "It wasn't … happy? What do you mean? It's alive?" "I guess I should have called, but I figured it seemed like something you'd want, what with you planning a traditional Thanksgiving and all." "Authentic is different from a bloodletting. I can't ... I can't kill ... Oh, my God ..." Her head spun. "I have a dog and a cat and now a turkey. I have no dinner. There is no Thanksgiving without a turkey." "Why don't you sit down a minute?" Quinn guided her to a chair. "It isn't the end of the world." "Oh, no, don't laugh at me, not today. Today wasn't supposed to be a funny sort of day—it was supposed to be a perfect and wonderful day." Then the dog bounded down the stairs barking, his feet slipped on the hardwood floors and he slid into the wall with a thud. "When did you get a dog?" "He must hear the turkey." A crushing, tight pain seized her lungs. She was breathing too fast. "I could handle the pumpkin, the unexpected tag-alongs, and even the puddle on my new porch, but no dinner? You can't coast through Thanksgiving without dinner. Thanksgiving is all about the dinner." "Annie." He placed his hands on either side of her face. "Annie, don't be so melodramatic." "I can't get to the grocery store before it closes, and nothing is open tomorrow. If we were in the city ..." She stopped then. Quinn's face was so close. He was touching her. Her heart pounded with new panic—no, panic wasn't the right word—excitement? Would he kiss her? His gaze strayed down her face before becoming snagged on her lips. She opened her mouth. "Oh ..."
His quick intake of breath caused an erratic jump in her stomach that felt suspiciously like butterflies. She leaned closer. He blinked. "Um." His eyes widened, then he removed his hands from her face. In the next moment, he had stepped away, well beyond reach. "There, you're returning to earth now." He cleared his throat. "I have stuff in my freezer. You're welcome to it." "Stuff?" 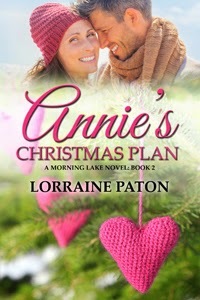 Annie rubbed the ache in her chest that she wasn't sure was from the turkey problem or yet another near-kiss with Quinn. The dog stood on the threshold and barked. "I've got roasts of pretty near every description. I know it isn't a turkey, but—"
"A roast? No, a roast is good." She nodded quickly. "Dumbbell, enough!" The dog's barks quieted to a whimper. She rubbed her forehead. "Quinn, would you adopt my turkey?" "I can take the turkey." He grinned and shook his head. "I'll be by later with a roast." When he left her in the kitchen, she jerked a cookbook off the shelf. So help her, the beef dinner would be perfect. "Who was that, dear?" Merry asked, as she entered the kitchen. "Quinn. I think I mentioned him." She dragged her finger down the table of contents of her favorite recipe book. "Quinn. Hmm …" Merry's tone caught her attention. "He's helped me around the house a bit. He's a neighbor." "He seems to be an exceedingly helpful neighbor. He seems to know you quite well, too." Good grief, what had Merry seen? Had she seen Quinn almost kiss her? Merry's eyebrows lifted high on her forehead. "I won't say a word." Merry nodded conspiratorially and put her finger over her mouth. "We all have our little secrets." Do you think Quinn thought about kissing her?